Firstly this isn’t my first time as an ‘owner’, I grew up with pets (mainly dogs because my mum wasn’t a cat fan) but this is the first time I’ve rescued one. For the past several months I’ve been going on and on about getting a dog. I talked about it so much I think my friends and colleagues were getting rather bored with me not taking the plunge and just doing it. Frankly I was getting fed up with myself. However I did have good reason for taking so long to make up my mind. The decision to add an additional member to any family – well, it’s a big deal and ultimately I had to convince my partner who wasn’t 100% sure it was a good idea. We both work full-time which means we’re not home during the day for at least 8 hours and even with a dog walker to take it out – it wouldn’t be fair. Whilst intellectually I knew getting a dog was a bad idea, this didn’t stop the emotions of really wanting one, so much so, I had even picked out the breed. Several years ago I came across a Vizsla and immediately fell in love, it was a chance encounter in London’s Portobello Market, which I still remember vividly. I won’t bore you with all the details but I have to say I met the most beautiful and well behaved creature that day. The dog and owner appeared to be made for one another, something rather enviable in its own right. The owner and I had a chat and from that point on my dog of choice was Vizsla. Similar such encounters would follow, all serving to reinforce my feelings. Keeping logic on hold I began to research and went looking for my Vizsla. It would take me nearly two years to come to an acceptancethat it would have been wrong for us to take on the responsibility of a dog while working full-time. I was gutted but knew it was the right decision. and then along came Charlie. Just when I’d given up looking, he found me thanks to a friend who was trying to find a new home for him. 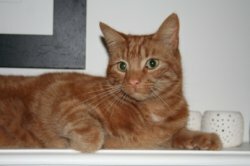 Charlie’s previous owner was no longer able to care for him – she was unfortunately in hospital. My friend had her own cat and he wasn’t taking kindly to the new lodger. Without nearly as much thought as I put into getting a dog, Charlie was welcomed with open arms. It’s amazing how quickly I fell in love with not only another breed but another species all together. What can I say about Charlie, he loves to sleep, is very cheeky, playful, loud (nothing ninja about him), always hungry and likes his cuddles. The best part about Charlie is that we rescued him. But we’re the lucky ones. He wasn’t going to have a problem finding a home, not with that face. He’s only been with us for four weeks but is already very much a part of the family. They say cats and dogs have very different needs, and cats are more than happy to stay home all day long and sleep. Just in case this turns out to not be the case for Charlie I know where I can find him a playmate or two. Although Charlie didn’t come from a shelter, he was in need of re-homing and I consider this rescuing. I highly recommend pet adoption if you are able, our four legged furry friend has added so much warmth to our home. 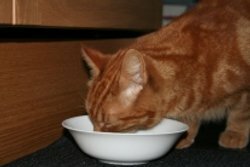 As for curbing his appetite we lovingly give him Organic Pet Minis as a treat plus his favourite cat milk. As for the treats, he wasn’t sure at first but funny how they’ve all disappeared and it’s time to stock up on more. I’ve put in a request to my colleagues at Ethicalsuperstore.com to bring on board ethical pet toys. I’m certain Charlie would love to get his paws on a hemp mouse. Finally on a more serious note, there are a lot of animals in need of good homes and the credit crunch isn’t helping this situation. If you see a pet in need please contact your local shelter, in my experience they are always willing to help. Previous story Planned, Did – Now For The Review!